Welcome to The Drift where Jalopnik East rounds up the highlights from all around the Pacific Rim. In today’s headlines, Toyota recalls 625,000 Prius Hybrids because of a potential software error and its union negotiates for a better family allowance, while Mitsubishi takes over a Ford plant in the Philippines. The recalls just keep on coming as Toyota announced the recall of 625,000 hybrids in Japan, North America, and Europe. Toyota says the issue is in software that controls a power converter, an issue which seems eerily similar to another recall of 1.9 million Prius hybrids last year. In the involved vehicles, the current software settings for the motor/generator control ECU and hybrid control ECU could result in higher thermal stress in certain transistors, potentially causing them to become damaged. If this happens, various warning lights will illuminate and the vehicle can enter a failsafe mode. In rare circumstances, the hybrid system might shut down while the vehicle is being driven, resulting in the loss of power and the vehicle coming to a stop. More than half of the vehicles are located right here in Nippon, but the rest are distributed elsewhere. Mitsubishi Motors is planning to make 30,000 Mirage subcompacts at a factory in the Philippines it purchased from Ford in 2014, according to Nikkei. Mitsubishi is hoping to take advantage of tax incentives which will bring its costs for production within the PH to levels seen in other Southeast Asian countries like Thailand, which already produces a range of vehicles for several automakers. In order to qualify for the incentives, it will need to produce 200,000 vehicles over a period of six years, beginning next year. Car sales in the Philippines have risen 30% in recent years, and with Mitsubishi only trailing Toyota for market share, the three-diamond automaker hopes to cash in on its popularity by providing locally made products. The UAW and the Big 2.5 aren’t the only union and automaker negotiations currently going on. In addition to its recall woes, Toyota is currently negotiating with its labor union about restructuring of the “family allowance” reports The East Times. Union representatives argue that the current allowance is weighted too heavily towards the “spouse allowance” versus the “child allowance” because there has been very little change in structuring since the allowance was first created. Union contentions are that the current structure is based heavily on the 1940s, 50s, and 60s idea that Toyota workers are single breadwinners with a stay at home spouse, and that workers still have wage parity with previous generations. Instead, real wages have dropped, and Japanese families increasingly have two income earners. Child care, especially pre-school and kindergarten, is exceptionally expensive in Japan, and with both parents working out of the home for lower wages, the union no longer considers the current structure realistic. It is calling for the elimination of the “spouse allowance” entirely and a four-fold increase in each child allowance. They point to the efforts of the Abe administration to involve more women in the workforce while also promoting population growth, but they don’t seem to be getting much traction with management. We’re the only ones to rethink how fair the family allowance is within the organisation. 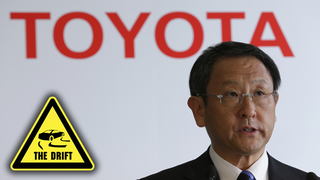 Toyota is supposed to have meetings with the Abe administration over this very issue in the near future. Images via AP, Mitsubishi and Toyota, modifications by Kat Callahan/Jalopnik.